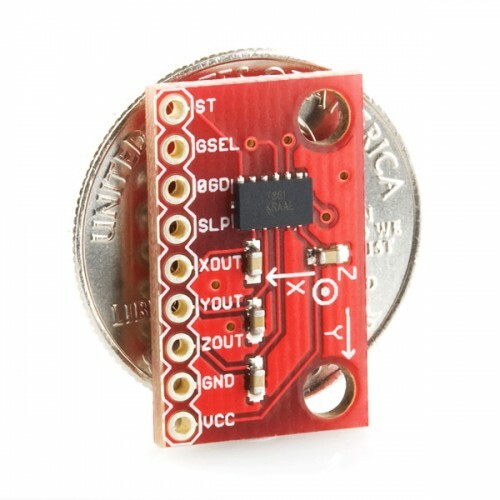 This is a breakout board for Freescale's MMA7361L three-axis analog accelerometer. The sensor requires a very low amount of power and has a g-select input which switches the accelerometer between ±1.5g and ±6g measurement ranges. Other features include a sleep mode, signal conditioning, a 1-pole low pass filter, temperature compensation, self test, and 0g-detect which detects linear freefall. Zero-g offset and sensitivity are factory set and require no external devices. This breadboard friendly board breaks out every pin of the MMA7361L to a 9-pin, 0.1" pitch header. The sensor works on power between 2.2 and 3.6VDC (3.3V optimal), and typically consumes just 400µA of current. All three axes have their own analog output.